Apple has confirmed a new, cheaper 2018 iPad, primarily aimed at the education market but available to everyone. The announcement came at an Apple launch event today in Chicago, during a presentation with lots of talk about how great iPads are for learning. The new 2018 iPad is a refreshed version of the current 9.7" iPad which now brings support for Apple Pencil. The new tablet comes with an A10 Fusion chip, an upgrade on the processor that powers previous iPads. It'll be available in silver, space grey and a "new gold finish." The price of the new iPad will be $299 for schools, and $329 for everyone else, available to order today. In the UK, the price is set at £319 while "schools can purchase iPad for a discounted price," according to Apple. You can read more about the new iPad in our story here. 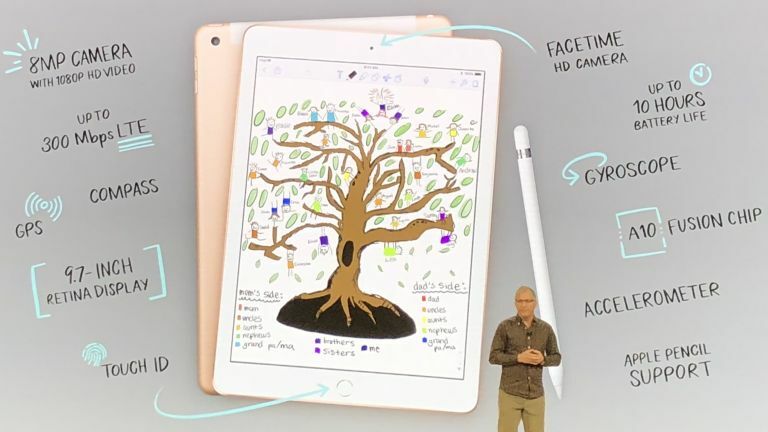 Apple also announced new versions of Pages, Numbers, and Keynote which support Apple Pencil and an upgraded amount of free iCloud storage for students from 5GB to 200GB. The event, which took place at a high school in Chicago, promised "creative new ideas for teachers and students" and talked up how iPads are used in classrooms before announcing the new tablet. Perhaps coincidentally, Google and Acer just made a push at getting more tablets into the hands of students with yesterday's announcement of the first Chrome OS tablet, which has the same screen size as the iPad and will retail for $329 – so the new iPad just undercut that by $30. That's not a surprising launch as Chromebooks are popular with students, so it follows that Chrome tablets would also be. It's also not surprising that Apple wants a bigger piece of that pie for itself, hence the cheaper iPad. In Tim Cook's words from the event "This is an important day for Apple. We hope that it’s an important day for students and teachers around the world, too." So here is what was officially announced at the Apple event: a refresh of the 9.7" iPad aimed at the education market, featuring Apple Pencil support. New versions of Pages, Numbers, and Keynote. 200GB of free iCloud storage for students, up from 5GB. And here is what wasn't announced: Other rumoured announcements were of a cheaper MacBook Air and a new iPhone SE, again aimed at students, but the smaller size of today's event suggested that those new devices might not surface today, and sure enough, they didn't.